Midrand Striders is an athletics club based at Curro School, Harry Galaun Street, Halfway Gardens in Midrand. The club was established in 1980 and has since grown to over 200 active members. The founding principles were fitness, friendship and fun and these are still true today. The club weekly runs, Tuesday time trials, Thursday track and / or hill work and Sunday long runs. Please contact us for any information about the club and its activities…. wish you a Happy Running! The club has its time trials with routes of 4 and 8 km scheduled every Tuesday. The time trials start at 17h45 in summer and 17h30 in winter. You are welcome to join us for social time trials on the first Tuesday of the month. 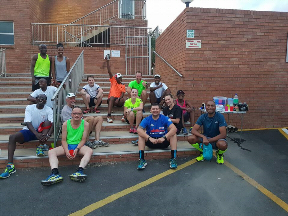 The club has long runs between 15 and 30 km (with a seconding car and water points at every 3 km to hand out drinks provided by club members) every Sunday. The cost for the Sunday run is R10 for club members. You can also hop into a car when you have had enough, or if you are falling behind the group. The exact distance to be covered on a particular Sunday is published on our calendar. As a member you will be required to second / assist at a club run at least once a year on a Sunday. Your will be allocated a date for seconding which will be noted when you register for the year. This is over and above assisting at the annual 21 km Club Race in August. A number of races of differing distances are selected for the Club Championship each year, any member of the club may enter these races at their own cost and submit their official times for entry to the Championship. Awards in varying categories are handed out at the annual Club awards. 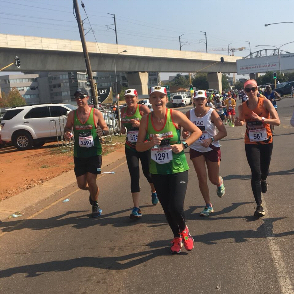 A member taking part in any ASA licensed event is required to wear the Midrand Striders club vest and plain black short, skirt, tight or pants at all times. The plain black shorts, skirts, tights or pants may be purchased at any sports shop or clothes retailers. Make payment of the club membership into Midrand Striders, 1686005644, Nedbank, Branch 168642. Please use your surname and initials as reference. Members are discouraged to make cash deposits / payments as they attract a surcharge of R20. Email your proof of payment (POP), a copy of the completed 2019 ASA Licensing form to spyle@happi.co.za. Arrange to collect your ASA License (and vest if ordered) from Sharon Pyle (0828051330) during Tuesday or Thursday run.